Register Log In GliderCENTRAL Forums Diet & Nutrition Diet & Nutrition 101 Misc ISD? I'm really not trying to troll here, but when you stay up 24hrs you end up thinking a lot and come up with a lot of questions. I feel that each question unless directly related needs it's own topic just to keep things straight. When I was introduced to AWD (Australian Wombaroo diet) I was told that they didn't have any reports of ISD (Iron Storage Disease), unlike with other diets; This frightened me a bit. Can someone A) please explain what ISD is and what it does to our gliders. B) Show lab or other fact evidence of the diet(s) causing ISD and/or why that was a conclusion. Photo: A man and woman walking on the beach.Hemochromatosis occurs when the body absorbs too much iron from foods (and other sources such as vitamins containing iron). This disease causes extra iron to gradually build up in the body's tissues and organs, a term called iron overload. If this iron buildup is untreated, it can, over many years, damage the body's organs. Although hemochromatosis can have other causes, in the United States the disease is usually caused by a genetic disorder. A person who inherits the defective gene from both parents may develop hemochromatosis. The genetic defect of hemochromatosis is present at birth, but symptoms rarely appear before adulthood. Because one inherits genes from his or her parents, this type of the disease is also called hereditary hemochromatosis. Because these symptoms also occur with other diseases, hemochromatosis can be difficult to diagnose in its early stages. To me, this means they would have to have a genetic predisposition (or another issue) that causes the body to not filter iron efficiently, thereby causing a build up. It doesn't indicate that simply ingesting too much causes the problem. I would also love to see documentation/research that indicates that diets are the cause of the problem in sugar gliders. I would like to know what the true cause for Hemochromatosis is in gliders. If it is genetic for example, then we would know those particular gliders may require a low iron diet. But that wouldn't affect every glider nor every diet. And it wouldn't indicate that any particular diet is "bad", just bad for "that glider". I could be totally misunderstanding this myself, so I would love clarification. But I think its a pretty bold statement that we have been presented lately with the introduction of a new diet to the United States. This is what the Wombaroo literature says about it. Excessive dietary iron can induce Iron Storage Disease (ISD), which is the accumulation of iron in body organs and tissues. In prolonged cases ISD can lead to organ failure and death. Some nectarivorous and frugivorous species are prone to ISD, and these species normally have low levels of iron in their natural diet. Although iron storage disease has not been widely reported in sugar gliders, evidence of tissue iron deposition has been seen in gliders at necropsy4. Many commercial human foods (eg baby foods) and supplements are fortified with iron and these should be avoided when feeding sugar gliders. Some commonly fed glider �recipes� may contain excessive iron content4. Wombaroo High Protein Supplement� contains less than 40ppm Iron and thus provides safe levels of iron in the diet. To what Glider Nursery Suggested: I know that in HORSES there is a genetic disorder called HYPP, it is only seen in some horses, particularly the descendants from a stallion named Impressive. Maybe Glidernursery is right and this is more of a genetic thing? Your post peaked my interest so I looked into sugar glider genetics and found a group that is researching genetics (or they were in 2010); When I tried to contact them my email was returned. I've started another thread about the group itself. If it is more about the genetics then the problem can be fixed by feeding THOSE gliders a lower iron diet as GN suggested. Last edited by Countryncrafty; 06/01/12 01:51 PM. Danielle, did you know that the ORIGINAL reason for the development of the WHPS was actually for flying foxes? Some commonly fed glider �recipes� may contain excessive iron content4. Wombaroo High Protein Supplement� contains less than 40ppm Iron and thus provides safe levels of iron in the diet. Does anyone have the exact amount of iron that is in the BML? I am assuming (although we all know that should not be done)someone does and that is why they feel they can say BML does contain too much. I would also like to see the reports from the folks that are claiming what they are claiming. But I think its a pretty bold statement that we have been presented lately with the introduction of a new diet to the United States. I agree 100% with this Shelly. I personally want to see the proof where the glider are susceptible to the isd.. everything that is written states there have been no cases reported or shown up on necropsies.. so no to me it is not apparently.. there is no proof anywhere that says the isd is an issue at all..
now I have sat back and said little to nothing since all this came to me less than a week ago.. and it did not come to me by way of Suz, but through the grapevine when someone asked me about the recipe for the joey BML..
for starts.. 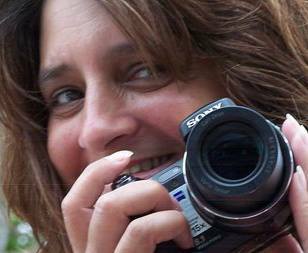 I love suz, we have collaborated over the years in many areas.. I as many other hold Suz's words very high.. but in this case I think that what is being said and is printed on her website is very irresponsible without the proof to back it up.. on her site she mentions it twice.. and now I am going to address both of those excerpts..
in the joey bml section.. she IMPLIES.. that the joey BML causes ISD..when she added this note..
"Note: Due to new information about Iron Storage Disease (ISD) affecting captive sugar gliders, I no longer recommend making the original Joey Formula recipe that I formulated several years ago. I also no longer recommend Baby BML for this same reason. " now since she never contacted me with any concerns at all, nor has anyone else... I am left to believe that the lives or health of gliders are not at risk, simply because if they were and there was truly some NEW information.. that information also would have been shared.. not just with me but with others as well. I do not believe in my heart that suz would never jeopardize the health or life of a glider with knowledge that she chooses not to share..
so with that being said. I would like not only on behalf of the BML, but also for personal knowledge.. like to know what NEW info it is that has arisen about sugar glider and ISD.. if it necropsies and histopaths, I would like to see those as well and have my people.. interpret them..
on her feeding page she has this she has written... and with that I also have many concerns that others do as well..
"Research done by the SUGAR Group over the past three years has revealed that almost 27% of the gliders necropsied during that time died from liver disease of one type or another. This sent up a red flag for many of us and we started to delve into why. It seems that Australian necropsy results show significantly less liver disease. 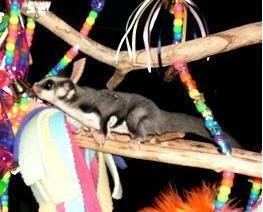 Apparently sugar gliders are susceptible to Iron Storage Disease (ISD), medically known as Hemochromatosis. It turns out that many of the diets we have been feeding our captive gliders here in the United States are very high in iron due to having iron-fortified ingredients in them. For this reason, I am no longer recommending any diet except the Australian Wombaroo Diet which has been fed successfully in Australia for almost 30 years. " I have worked with necropsies and histopaths over the years, I am not qualified to interpret what is written on them.. but one thing I have noticed over the years is that to the untrained.. they are vague at best.... in the health and hygiene section here at gc is a section called health and hygiene 101 and in that section is one called necropsies.. in that section is many many necropsies and histopaths.. that have been posted.. going again through them even after all these years.. the findings are still vague and there is rarely a definitive cause of death.. a lot of possible, could be associated with, may have contributed to.. a lot of possibilities based on the findings..
so now I want to know exactly who is interpreting the reports to come up with the reasons of death.. I have never seen any that can be cut and dry and said this death was caused by bacterial infection associated with ISD or associated with any specific diet, or ingredient in any diet. If a person who has not only a research organization whether they are 501c3 or not.. and has a website that is called Sugar glider vet info.. then that person needs to step up to the plate flash their credentials, and explain how they are qualified to determine what the necropsies say.. of having a website that is misleading in the name.. sugar glider vets.. giving vets the assumptions that the site is owned and run by vets. the site is an educational site that holds no more credence than any other glider owner that may have information they believe to be correct. with such programs, the credibility of such persons are assumed to be correct in not only it's nature but also the results. one thing I Have burned into my head from Dr Bruce is variables.. and how important those variables are in trying to get to the root of any problems.. to prove a positive you fist must disprove all negatives.. and assumptions can not be made as facts..
we can speculate, build suppositions, discuss the possibilities.. but many times we may never be able to find the answers. I hope for our gliders, that at some point people can and will work together for the gliders instead of taking forward steps and ripping them apart.. I know it sounds like an oxymoron seeing that I just voiced my OPINIONS... we have to start looking at what is.. and not just a person, a group may THINK it is. IF you make an assumption of how deadly a diet is.. whether it is pellets, BML, HPW Complete.. or any other diet out there.. Have you collaborating data ready, have your FACTS, not just speculations, in hand and address them with the manufacturer of the diet FIRST.. so they do can work on addressing those concerns.. instead of spreading speculations as facts. Has the SUGAR Group necropsies turned up iron deposits? or full-blown ISD? "Although actual dietary requirements for iron and vitamin C in sugar gliders are unknown at this time, we estimate that dietary iron concentrations should be less than 50 ug/g dry diet, and vitamin C should be 100 mg/kg. By calculation, all diet treat- ments in this study appeared to supply more iron and vitamin C than may be needed by sugar gliders (87 mg/kg, 175 mg/kg, and 292 mg/kg iron, and 212 mg/kg. 222 mg/kg, and 260 mg/kg vitamin C for diets A, B, and C, respectively), which may con- tribute to the observations noted. Transferrin and ferritin saturation parameters are much better indi- cators of iron overload than simply circulating total iron in blood samples, and tissue biopsies and his- tology are needed to confirm a problem. However, inferential evidence suggests that occurrence of iron overload may be worth investigating in more detail in this species. If a person who has not only a research organization whether they are 501c3 or not.. and has a website that is called Sugar glider vet info.. then that person needs to step up to the plate flash their credentials, and explain how they are qualified to determine what the necropsies say.. of having a website that is misleading in the name.. sugar glider vets.. giving vets the assumptions that the site is owned and run by vets. the site is an educational site that holds no more credence than any other glider owner that may have information they believe to be correct. I'm not really sure what you are saying here (except to give your opinion to discredit the vet info site), so I will just make some clarifying statements. 1. Yes, a PERSON owns the SUGAR group. That person is me. The SUGAR Group, however, does not operate as one person. We have a TEAM of people involved in order to ensure objectivity and to provide some validity. A TEAM of people makes decisions for the organization and is responsible for the day-to-day running of the organization. That team includes two veterinarians, a veterinary pathologist and a labratory technician. 2) One person does not own the vetinfo site - a group of people do. How that relates to this issue, I don't know. * Many/Most of our necropsies DO define a definitive cause of death. * The SUGAR Group has never - not once - attributed ANY of the findings from the necropsy effort to any diet. If/when we do have enough evidence to make such statements, then we will first alert diet creators and then we will post it on OUR website. If not posted on our website or from our PR representative, then you can guess that the statements made are not from the SUGAR Group. What other people choose to do with the information we put out is their business and not the responsibility of the SUGAR Group. It is unfortunate that any finger pointing is occuring, felt or implied. The necropsy effort can't make huge changes overnight. We continue to work toward our goals and we do put out new reports annually and sometimes bi-annually. We aren't just sitting on the information. It isn't surprising, though, that the passionate owners of this community would take the information and try to make sense of them within their own experiences. * The SUGAR Group has only two necropsy/histopath reports in which an unusual amount of iron was found. Neither of them indicate a diagnosis of ISD and neither of them make mention of diet in the analysis. The first I had heard of ISD was this year at the RRRoundup and at that time, there was no discussion (that I recall) of ti being related to any specific diet. Maybe once again information is being passed that is not completely accurate and causing panic amongst glider owners. I have read so many interesting (and some that will make your head swim and feel like it is in the midst of a water spout all at once)studies (from Australia) about diets. Not one of these mention ISD in them (not saying there are none out there). They have covered just about everything including Prenatal Protein in sugar gliders and Nitrogen(protein) requirements and the changes in diets due to different types of weather, environment and accessibility to foods. Although it is common knowledge that too much of one thing can be just as dangerous as not having enough, I just dont see where a diet can be accused, of what seems to be, one case of ISD in an older glider, of being a danger. Just like with people, each glider is different. For example, I am allergic to onions so I cant eat them, but does that mean any of you (who are not allergic) should not eat them because of the affects I have from them? Just because my sister in law swells up like a balloon and has to go to the ER if she even looks at shell fish does not mean I will ever give up my love and appetite for shrimp. There are just too many Google Degree folks out there. If you want to know exactly how well your glider is doing with the diet you are feeding start off by getting a baseline blood panel done and a bile acid test. In a year of feeding the same diet do it again, and then every couple years. Think about it,isnt that why we get checked for cholesterol and blood sugar readings...and if those numbers come back out of whack, what do we have to do? Change our diet. But without the proper testings, we wouldnt know for certain and we would just be guessing right?? Thanks for that info Val, knowing that necropsies are not actually pointing to diets as a cause of death OR ISD sure makes me feel better! Shelly, again I agree with you. We need to be able to see also any tiny changes in our own gliders. Changes that could indicate a problem and may or may not be due to diet, such as: appearance, behavior, body language, movement, mood swings, etc. I see that Lori is upset about something on Suz's site, but I don't understand what that has to do with the sugarglidervetinfo site. As President of one of the organizations that collaborated on the sugarglidervetinfo site, I will reply to the parts of her post that I understand. My people are licensed pathologists. I'm not sure what other people should be interpreting necropsies and histopathologies. In the necropsies I've seen, there is a cause of death. It's not written in layman's tems, but it's there. so now I want to know exactly who is interpreting the reports to come up with the reasons of death.. I have never seen any that can be cut and dry and said this death was caused by bacterial infection associated with ISD or associated with any specific diet, or ingredient in any diet. As I said, licensed pathologists are creating the reports. I've not seen their licenses with my own eyes, but I must assume the lab would not hire unlicensed individuals due to liability reasons. No, I've never seen a diet as a cause of death. No, I've never seen ISD mentioned in any of my reports. "The organizations which have contributed to create this site - Sugar Glider vet Info - are made up of a variety of individuals, with over 50 years combined experience with sugar gliders. We have individual pet owners, small breeders, non-profit organizations, and rescue homes. No one in these organizations stands to gain anything tangible from the existence of this site. Our only goal is to further sugar glider knowledge so that we all, veterinarians and pet owners, can provide better lives for sugar gliders." It states our credentials: individuals. We do not claim to be vets. It is an educational site. I hope for our gliders, that at some point people can and will work together for the gliders instead of taking forward steps and ripping them apart..
To reiterate: three organizations did work together for the gliders. The SUGAR Group, The Glider Initiative and SouthEast Companion Animal Rescue & Education Services, Inc worked on the sugarglidervetinfo site together. I don't know what you mean by "ripping them apart". someone correct me if I am wrong here, but diet wouldnt be mentioned as a cause of death unless the person/animal choked to death on a piece of food. I think the issue here is, and FOR EXAMPLE ONLY: lets say a glider died and the report showed it died due to liver failure. The question would then be "why did it have liver failure" and many will suggest it was the diet. which it COULD be, but MAY NOT be. It could have had liver failure from something else. * The SUGAR Group has never - not once - attributed ANY of the findings from the necropsy effort to any diet. If/when we do have enough evidence to make such statements, then we will first alert diet creators and then we will post it on OUR website. Not necessarily true. Here is an excerpt from a necropsy, which was shared with the Sugar Group. Just to clarify, there was no ISD and this glider had never been fed BML. My gliders are now on BML and will continue to be until proof is presented that BML has in fact caused ISD. Actually, it is not uncommon to find reference to dietary issues in necropsies. That is not to be confused with referencing a specific diet used in this community. My statement was that the SUGAR group does not attribute any illness or cause of death to any of the diets recognized and used by this community. However, necropsy/histopath reports will make mention of ingredients found in the digestive tract, lack of food, emaciation, hypervitaminosis, and/or several other issues that are related to food/diet. Thank you Val for that clarification. even on Nancy's where they list their "findings".. that state.. "lesions indicative of......."
The point I am trying to make is that for the most part they are vague at best..
now some one had posted a response to the effect that there is a necropsy that directly blames the pelleted food..
... and without specifically being told to look for some thing example aflatoxin.Vit A toxicity, vit K3 Toxicity Selinium Toxicity. that even on the histopaths it is not something they look for on their own... things like the hepatitis liver.... can be indicative of many issues..
there are also many reasons.. for some nutrients not to be processed properly.. as was seen in the glider epidemic (shaking glider syndrome) of many years ago... where blood tests showed serious imbalance of nutrients, and they had HLP type symptoms and neurological type symptoms. The words liver disease in itself is a general.. there are many many things that can cause the liver to show changes.. If necropsies are so vague and unreliable, why does everyone push so hard for a necropsy to be done? If definitive answers aren't going to be given anyway, why spend the money to have a necropsy done? Same with the histopath. What you are saying is that unless we tell them what to look for,such as aflatoxins, the results will be less than accurate. But if we KNOW what the cause of death is, and tell them what to look for, doesn't that mean it is pointless to have it done? Is it only to confirm our suspicions? Well, again, if you can't trust the results of the necropsy and histopathology reports because of the terms they use, such as indicative, then how is this any benefit at all? Seems such a HUGE contradiction going on. I'm really trying to wrap my head around this, but am having difficulty figuring it out. Are you, Lori, now saying that it's up to the owner to tell the licensed pathologist how the glider died? In your previous post, you wanted to be sure it was a qualified person reading the necropsies. You also stated that to an "untrained" person, the reports are vague. Now, you think the licensed pathologists cannot determine a cause of death without an untrained person leading the way? I'm very confused. Dancing Maybe you misinterpreted or misunderstood where I was going with this.. This is not a matter of necropsies and histopaths not being important, valid or much needed, that simply is not the case..
it is a matter of reporting something as being definitive, and at best being something that is just implied.. possible, looks like, could be's..
there is immense importance to the necropsies and histopaths, people have them done for various reasons.. some for research purposes, which is what the sugar group does, some the owners want closure, some to prove they didn't do something themselves to cause the deaths.. but many because they are looking for definitive causes.. and the truth of the matter.. definitive causes.. sometimes are found.. heart enlarged, liver enlarged, bacterial issues, blockages.. body not metabolizing nutrients properly... but the underlying causes.. the reasons the steps that lead up to that final demise is rarely if ever uncovered.. People need to understand that..
reasons could be many, reasons could be few. but the pathologist who is holding those answers RARELY has the complete information.... there are so many variables involved..and I don't have to tell you, as a previous rescuer.. that people don't always tell the whole story.. and those that do try.. usually either miss something , or just plain didn't know. The complied information... is cut and dry, it is definitive, it is categorized, separated, percentages tallied.. based on the findings... of what COULD be the contributing issues, and many times not even contributors..
Research done by the SUGAR Group over the past three years has revealed that almost 27% of the gliders necropsied during that time died from liver disease of one type or another. This sent up a red flag for many of us and we started to delve into why. Based on the findings of the sugar group.. that they had posted from necropsies and histopaths... I believe that Suz interpreted those findings as definitive conclusions.. The only source she referenced was the sugar group, she also referenced the necropsy study, so was she using those records as supporting evidence? are people led to believe that the diets we feed here, are causing these liver issues? what other source was used to determine that ISD is apparent in gliders? are the posted results of the necropsies leading people to believe that they are the definitive roots.. to the cause of death? that she and many others feel that the sugar group has proof for the ISD? I still can't get past that the sugar group was the only reference she listed, and it appears she is using the percentages for the liver issues to validate the ISD claim. .. definitive causes.. sometimes are found.. heart enlarged, liver enlarged, bacterial issues, blockages.. body not metabolizing nutrients properly... but the underlying causes.. the reasons the steps that lead up to that final demise is rarely if ever uncovered.. People need to understand that..
See, I DO understand that. My mother for example. Simple cause of death was suffocation. The reason for the suffocation was pneumonia. The reason for the pneumonia was infection/complications from lung cancer. The reason for the lung cancer COULD have been years of smoking or it could have been asbestos, or could have been the smog in the CA air she lived in for so many years of her life, or it could have just been some random genetic mutation resulted in cancer. Truth is...we will NEVER know the cause of the cancer so in TRUTH, we will NEVER know the cause of her death. So, if the "looks likes it could be", the "insert what ever term you choose here" etc are not going to be accepted as cause of death, then again, I ask...What is the point? 1. Suz looked into the subject of diet/nutrition. opinion/belief on her privately owned site. 3. Lori was upset by Suz's new recommendations. From there, the discussion has wandered from statements that necropsies are vague to statements that the sugarglidervetinfo.com site is misleading in its name to statements that owners should be telling the pathologists the answers. I'm just not sure of what the issue is. If a simplistic cause of death is desired, then that answer is cardiac arrest. The heart stops, there is death. The necropsy/histopathology is to determine factors that led to that. Liver disease, kidney failure, cancer...these may be the cause of the cardiac arrest. These, along with other observations, will be listed in the necropsy/histopathology report. This information is what is then used to help us learn how to improve our husbandry techniques. For example, if the statistics show liver issues were noted in 80% of the cases, we would realize that there is something in our current techniques that is detrimental The common sense assumption would be to look at what our gliders are ingesting, not at what type of enrichment was provided. The necropsy/histopathology reports are meant to guide us in the right direction. 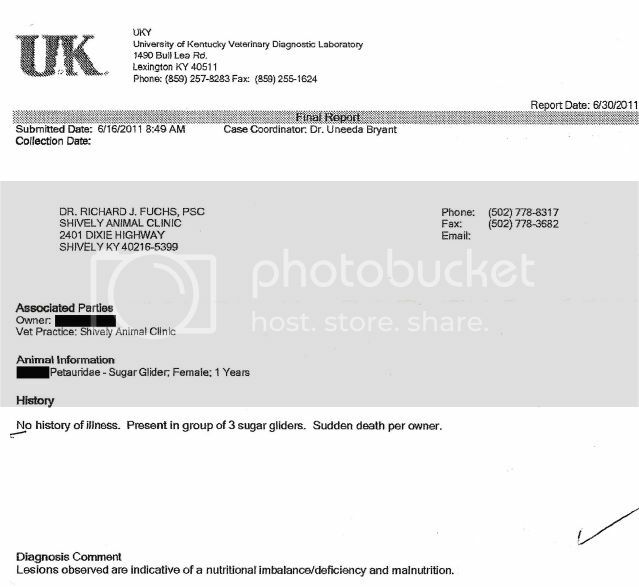 If the issue here is just that Suz removed the BML formula from her privately owned site, then that has nothing to do with the sugarglidervetinfo.com site or how the cause of death is written in a report. I read Suz's site and don't understand the problem. She didn't not state that BML causes ISD. She just stated that she now only recommends the Australian Wombaroo diet. She states her reasoning as the fact that the majority of the "American" diets contain iron-fortified items and she is concerned about that. That's her right. I don't see a reason for any of the diet creators to be upset by that. It's OK that their diet contains iron and it's OK for Suz to be worried about it. The SUGAR Group just provided statistics based on their findings. I believe it was specifically stated in this thread that they have not found ISD or death due to a particular diet. Those statistics were shared so that we can all learn. I, personally, don't think ISD is a worry. I am happy to see people looking at statistics and forming new ideas and questions based on them. I am proud of my organization's participation with the sugarglidervet.com site, and I believe necropsies are a valuable tool. I hope that covers the possible issues. I fully understand and agree that each of us has the right to publish whatever we want on our own websites, so long as there are no copyright infringements. My take on this, for whatever it is worth, is that by her removing the diet she has recommended for many years with her new added statement does indicate that she feels our diets (not just BML) are unsafe and are causing ISD. I'm not a diet creator, nor pushing a new diet, but when I read that on her site, I as a glider owner was immediately concerned about the diet I was feeding. So I did what we always recommend to others. If you have a question regarding the diet you feed, go to the creator. So I did, and was surprised to hear that the creator was not aware of it. I am concerned that this information is posted on such a well respected site that many of us refer others to and is being copied onto other sites as factual information causes serious concern to owners. The only source she has referenced is The SUGAR Group. Based on that, I "assumed" that the ISD info came from SUGAR. Since then, Val has stated that SUGAR has no such findings. My question would be where did this information come from? Because if our current diets are causing issues, and no one else is apparently aware of it, I would hope that data would be shared with others so we can improve things. The info should be shared with SUGAR to compare to what they already have, and most definitely should be shared with the diet creators. Sooooooo, this thread is no longer about iron storage disease? The only source she has referenced is The SUGAR Group. Based on that, I "assumed" that the ISD info came from SUGAR. Since then, Val has stated that SUGAR has no such findings. Thank you, Shelly, for posting this. I have wondered since Bourbon's first statements how the heck any of this became the fault of myself or the SUGAR Group. Now that I see that there were assumptions made, it makes more sense to me. My question would be where did this information come from? Has anyone asked Suz this question? The information did not come from the SUGAR Group. As was stated here in this thread AND when the Australian Wombaroo diet was first discussed on other boards, the SUGAR Group has no evidence of this being an issue in sugar gliders. Perhaps the reason is that we aren't doing the right tests, so I did send a message to the pathologists we work with to ask this very question. But, perhaps it really just is not an issue with gliders. If I remember correctly, Gordon Rich from Wombaroo stated that they are not seeing it in their research either. (correct me if I am wrong on that). Dancing, to respond to your "what is the point?" here is my thoughts: EVERY bit of testing and information that we can gather is valuable. There is a misconception that one single necropsy/histopath report is somehow going to change our understanding or answer all of our questions. That is not the case. This type of research is about a collective volume of reports, which, when compiled begins to show us patterns and areas of concern. Forward movement in the research causes us to say "we need to be looking here further" or "we need to ask for additional testing in these cases" and so on. We take what we have found so far, focus on those areas which seem to be the most pressing, and develope methods for further data collection. This is an ongoing process and, for the SUGAR group, means that a completed "liver" study is not complete until we have a necropsy survey, necropsy and histopath reports, a completed liver issues survey and in some cases a completed death survey as well. We aren't just looking at a necropsy/histopath report, we are putting together information from several sources. We ARE working toward answers in an environment free of all this emotion and need to prove something. Necropsy/histopathology is not about answering all of our questions right now, it is about finding general answers (answers to some of our questions) and then using that information to MOVE FORWARD. This takes time. It takes cooperation. It takes involvement. It takes patience. But, it works to find answers. I, too, wish that we had all the answers right now. Since we don't, I'm patient and committed enough to keep working toward them. I agree that it would be great if we all were working toward answers and working together. That won't happen by blaming an organization for issues it has no involvement whatsoever in, by disparaging a website created just to help, by trying to discredit organizations which HAVE worked together to create a project, by making assumptions rather than asking questions, by discrediting one study because the time frame and representative sample was so small and then complaining that raw/unanalyzed/incomplete study information from the SUGAR Group isn't made available to you, by using circular reasoning, or by asserting that the trained and licensed pathologists working across this country are somehow not qualified to do their jobs. Perhaps those stating they would like to see us all working together could start by modeling this behavior themselves. Last edited by Jackie_Chans_Mom; 06/05/12 01:47 PM. I do understand about the necropsies and how they might not lead to the answers we are seeking but lead to the RIGHT questions to be asking. My posts on this thread were really directed to Bourbon because of her extreme contradicting comments about how they don't provide answers anyway. A single necropsy report isn't (most likely) going to provide an owner with a reason their glider died. A collection of necropsies MIGHT lead to some answers if the right questions are being asked. I do understand this type of research is not an over night solution. I posted my questions in this thread because I've had so many others ask me about necropsies and if it will tell them for sure why they lost their glider. ... some the owners want closure, some to prove they didn't do something themselves to cause the deaths.. but many because they are looking for definitive causes.. but the underlying causes.. the reasons the steps that lead up to that final demise is rarely if ever uncovered.. People need to understand that..
that people don't always tell the whole story.. and those that do try.. usually either miss something , or just plain didn't know. The results of the necropsy I had done indicated that diet was a major factor. That dog was beaten to death already and it is not my intention to resurrect that painful and emotional discussion. We HAVE to have faith in the pathologist entrusted to determine cause of death, contributing factors, genetic predisposition, whatever. I made a change to diet based on the findings. I changed to BML. I shared the findings with the SUGAR group. Hopefully answers are forthcoming from Suz or a group or whomever has documentation that ISD can be caused by excess amounts of iron in BML or any diet. I too understand that it usually is a process of elimination to determine the root cause of many deaths, ailments or otherwise with animals OR humans. Heck, most of us have been frustrated trying to get a straight diagnosis from a doctor only to have to wait to rule out everything in the world before we can get answers. Sometimes those answers never come. For example, my daughter has epilepsy. She was diagnosed when she was 12. We had every test in the world done to determine the cause. Guess what? Nobody was able to tell us. She will be on medication for the rest of her life. Is that the best solution? Nope. I would have loved to hear a "definitive answer": "This is what is wrong and this is what will correct it." Didn't happen. She and I can live with that. She is happy and healthy and her seizures are completely controlled with medication. I do apologize for going off on a tangent. Vague answers are all we get sometimes. Does that mean they are any less useful or helpful? I'd like to think we can come to some kind of conclusions or recommendations to ensure the health of our gliders, or at the very least to "do no harm". Necropsy/histopathology is not about answering all of our questions right now, it is about finding general answers (answers to some of our questions) and then using that information to MOVE FORWARD. This takes time. It takes cooperation. It takes involvement. It takes patience. But, it works to find answers. I, too, wish that we had all the answers right now. Since we don't, I'm patient and committed enough to keep working toward them. Val.. did you talk to suz about her gliders passing? she ask you VERY SPECIFIC questions regarding the liver issues? would you like to enlighten us about what her questions were and how you responded..
you have been answering as the sugar group.. I still am not quite sure how you responded to Suz yet.. as the sugar group or as Val.. so I guess that is where I am going to start? also could you tell us the many different things that could be contributing issues/factors that would show up on a necropsy/histopath as "hepatitis/liver disease"
Val, this discussion has brought up a few questions for me too, which I hope are OK to ask. - What is the time period for the 19% of liver related deaths? - Were any conclusions able to be drawn or commonalities found about the liver related deaths? - Were any conclusions able to be drawn about any ingredient(s) in the diets gliders were on at the time of death or at any time during their life for each diagnosis? - Did those necropsies or surveys reveal any kind of toxin the gliders might have been exposed to, ingested or in their environment? I very much appreciate work done by SUGAR or any organization to help us learn. There is a huge, overwhelming pool of data out there, which can teach us so much more than just looking at individual cases. Let me continue.. you said the results are based on the surveys as well as the necropsies and histopaths.. however when I looked at the surveys, they are questions in there that has nothing to do with possible liver issues, but yet there are many missing regarding environmental, toxins, diets etc... for example..
however there are no questions regarding insects, where they get them from household plants, dry food storage, storage of other foods that are offered.. ..
and then when i went to the kidney study, again it was not kidney specific..
then when I went to the death study, there were a handful of questions, but they all seem to be pretty standard. I understand that a group of you put these questions together. but wouldn't including ANYTHING and EVERYTHING that could be associated with the liver disease be more complete and more specific to what is actually being studied..? and without all the commonalities that may affect the liver.. that most glider owners do share or not.. then you are leaving the doors wide open for assumptions based only on the questions you are currently asking.. which seems to be centered around just frozen diets.